For decades, the Singapore River has played an important role in Singapore’s thriving trading industry. In the 21st century, the river acts more like a scenic boundary that separates the country’s Colonial District from the Central Business District. If you look at the iconic Singapore River today, it’s so hard to imagine that it was an ugly and dirty commercial district full of warehouses and old boats. Fortunately, the government decided to clean this site up in the 1980’s. Today, the Singapore River has been transformed into one of the country’s major tourist hubs. Most of the boats that you will see cruising on it today are new and nicely decorated models, used for sightseeing tours. Strictly speaking, quays are man-made platforms set alongside or into water for the purpose of loading and unloading ships. But the quays of Singapore are more like commercial and entertainment centers that grant the river not only a lively atmosphere but also a certain appeal for locals and tourists alike. You can say that the quays are a great addition to the once empty Singapore River; but the view of the pristine Singapore River has become the main attraction for the quays. When I think of Boat Quay, the image of seafood comes to mind! This is where you will find restaurants deliberately displaying water tanks outside their entrances. They fill these small tanks with incredibly large fish, crabs and lobsters; with the hopes of enticing tourists to shell out some cash for a hearty fresh seafood meal. It is definitely hard not to notice the mighty Alaskan crabs and Atlantic lobsters as you walk by Boat Quay. They will certainly make your imagination run wild and your stomach rumble. Unfortunately, these delectable displays have been the center of several controversies in the past. A few conflicts started when these seafood restaurants refused to offer a menu that clearly marked prices for their seafood meals. Soon, thereafter complaints were made that such restaurants tried to hard sell and lure tourists into dining and ordering their seafood without being totally transparent with their prices. This practice led to overcharging and many arguments between restaurant staff and diners. The last time I visited Boat Quay, it was quite noticeable that these seafood restaurants have already changed their strategy. Some of the former seafood establishments have been turned into western-looking restaurants complete with dinner menus and lunch specials. There are also more English-style pubs lining up Boat Quay, and thus, they are attracting more local folks who just want to have a drink or two after a hard day’s work. The nearest Metro Station to Boat Quay is Clarke Quay Station. From this station, you only need to walk about 15 minutes to reach Boat Quay. 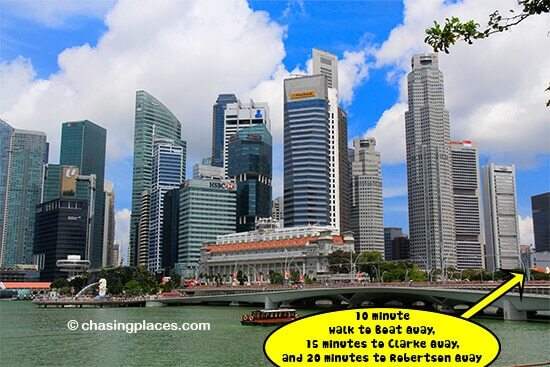 It is also possible to walk from the Marina Bay Sands/Marina area to Boat Quay. This walk takes about 15 minutes. Clarke Quay is not only the most popular quay on the Singapore River, but it is also the biggest and most developed one. While Boat Quay offers a laidback drinking and dining experience, Clarke Quay is more like its flamboyant and glamourous sister. Clarke Quay is home to super-sleek bars, trendy restaurants and rocking nightclubs. 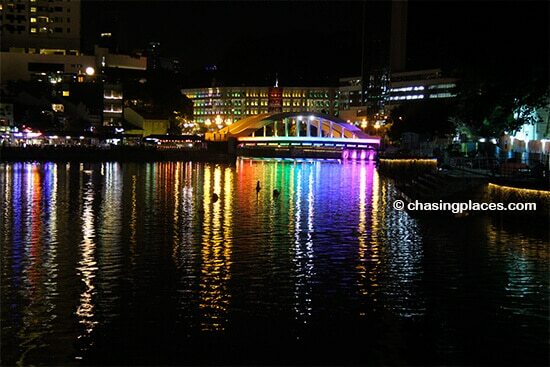 If you are the type who gets bored easily, Clarke Quay will do the entertaining for you. Most of its establishments have their own bands or acoustic singers. A very important note to remember: everybody dresses up at Clarke Quay! And if you don’t, you may feel a little out of place. The nightlife scene in this quay attracts lots of eye candy and distinct personalities wearing flashy clothes. But you will also catch some office people who want to dine and unwind! One of the best things about Clark Quay as a night spot is that it always has a festive atmosphere even during weekdays, due to the steady flow of tourists. So if you’re traveling alone and feeling a little lonely, choose Clarke Quay, because you will most likely find an upbeat crowd who is willing to mingle and make friends. Just don’t forget to bring your dancing shoes and practice your best smile! 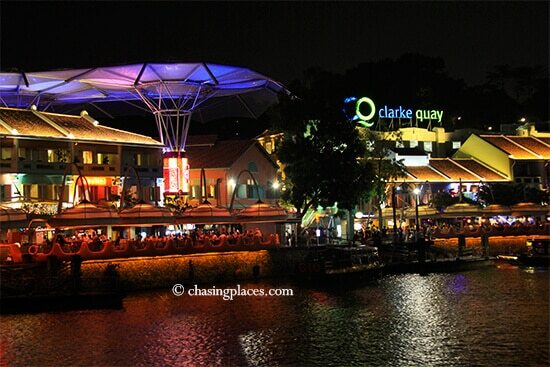 To learn more about Clarke Quay, click here. If you’re not a fan of the seafood selection at Boat Quay, or you want an alternative to the glitzy nightlife scene offered by Clarke Quay; then Robertson Quay may be the best quay for you, especially if you desire a laidback yet still enjoyable night in Singapore. Robertson Quay is home to the Singapore Tyler Print Institute, which is a regular host for exhibitions featuring international and local artists, mostly in the print and paper-making industry. There are also two known temples in the area: Chettiar Hindu Temple and Hong San See Temple. But like the other quays, Robertson’s main attraction is its wide selection of restaurants and bars. In terms of location, Robertson is the most isolated, and thus, the least visited by tourists. This is also the reason why this quay is more popular with locals, in particular those who like soft lighting and a low-key vibe. Even though the Singapore River passes through this quay, there is a dark stretch that separates Robertson from Clarke Quay. Thus, if you’re not familiar with the area, it’s actually pretty hard to determine that there is another nightlife spot along the river. 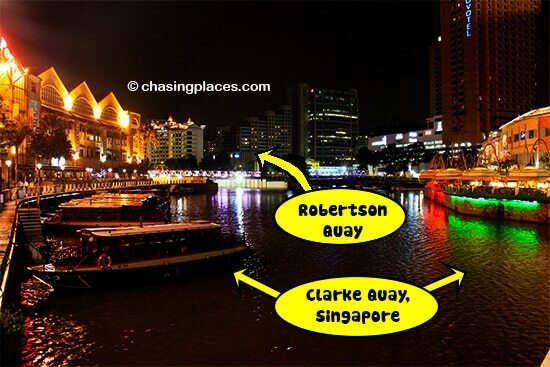 But if you just take a stroll beyond Clarke Quay for about 5 minutes, you will soon come across with Robertson Quay. The dimmer appearance and the absence of live or club music at Robertson sets the mood for chatting opposed to dancing and fist-pumping. This is a great spot to catch up with old friends, have a casual business meeting or even a candle-lit dinner with a gorgeous date. 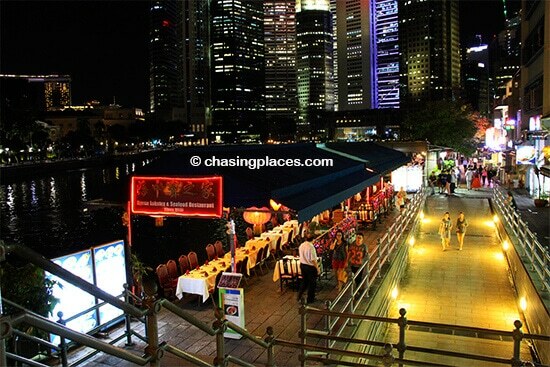 Boat Quay, Clarke Quay and Robertson Quay are not only ideal for drinks and socializing. They also make for ideal places to stay while in Singapore. If you stay in the vicinity of Boat Quay you will be a short walk away from The Merlion and the famous Marina Area. 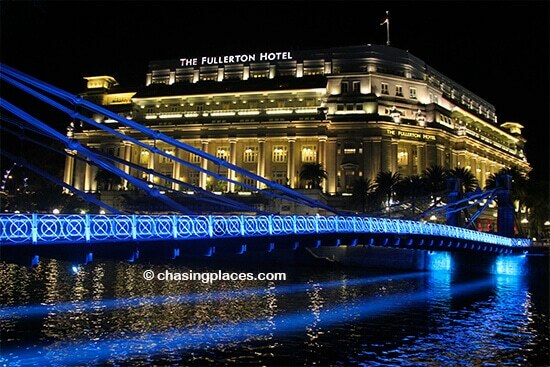 Many of the hotels in Clarke Quay are located on the water and offer spectacular views. They are also minutes away from Singapore’s convenient MRT network and Clarke Quay Station. If you decide to stay around Robertson Quay you will enjoy a quieter atmosphere with some comfortable options available. Based on our experience visiting Singapore, the top accommodation choice in this area is undoubtedly The Fullerton Hotel. The combination of its colonial charm and superb location make it hard to beat. Where did we stay while in Singapore? During this trip to Singapore we decided to stay at Jayleen 1918 Hotel. We do not have a direct affiliation with this property, therefore we can review it in an unbiased manner. The staff was super friendly and our room was clean, albeit a bit small. The breakfast was great for the price included in our booking. It’s only about 200 meters to the Clarke Quay MRT Station making its location ideal. At the time of writing it had a score of 7.4/10 based on 403 verified guest reviews. How to find the cheapest room in ‘expensive’ Singapore? We’ve had the best results with these three sites: www.agoda.com (large selection and solid prices), www.booking.com (excellent customer services and cancellation policies) and www.hotelscombined.com (the world’s best price comparison site). Regardless of where you decide to stay in Singapore, we hope that you have a great time! Where is the Best Spot to Stay in Singapore?